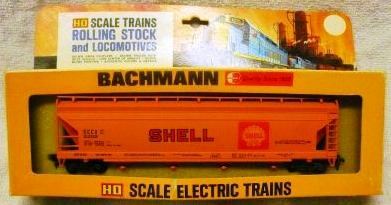 Pictured first above is the Shell Oil Center Flow Hopper is an early example from Bachmann. Notice the box and the car is placed in foam inside the package. A Shell Oil entry remains in Bachmann's line in later years, but as you may see from the second image the car's decoration is different. Bachmann's 56' Center Flow Hopper is among the first group of HO-scale rolling stock offerings in the company's 1970 product catalog. Six roadnames are listed in the 1970 catalog, Dupont Plastics, Enjay Plastics, Grace Plastics, Great Northern, Grace Plastics, Gulf Oil, and Shell Oil. The CP Rail Center Flow Hopper is the first roadname addition to the line in 1976, according to the Bachmann catalogs. The model retails for $4.00 in '76.